Did you feel there was something missing in today’s gospel reading? Were you expecting the reader to read a little further on? Surely the story can’t end with: “So the women went out and fled from the tomb, for terror and amazement had seized them; and they said nothing to anyone, for they were afraid.” It’s no great shout of joy and triumph. The other gospels all end with tales of meetings between the risen Jesus and the disciples: the great commissioning on the mountain in the gospel according to Matthew; the meeting on the road to Emmaus in the gospel according to Luke; the miraculous catch of fish and breakfast on the beach in the gospel according to John. I imagine that in the back of all our minds we think of Jesus’ resurrection as including all those things, in the same way that we imagine both shepherds and magi at his birth. The Gospel according to Mark, however, doesn’t tell us of any such meetings. This abrupt conclusion has been such a problem for the church that scribes later added two further endings to the gospel: and they’re in most versions of the Bible: called the shorter ending and the longer ending of Mark. But they aren’t the way Mark originally ended his gospel, and we need to ask why. Why does the gospel according to Mark end with a whimper rather than a bang? Mark tells us that Jesus died on the cross, crying out: “My God, my God, why have you forsaken me?” as darkness fell over the whole land. Now, the sun rises, and three women go to the tomb. Between them, these women had followed and served Jesus; had watched from a distance as he was crucified; and had seen where he was buried. That’s the last thing we were told on Good Friday: “Mary Magdalene and Mary the mother of Joses saw where the body was laid.” Unable to care for his body on the Sabbath, they now bring spices to anoint him. After the body has been so long in the tomb the spices probably aren’t going to do much to ameliorate the smell of decay, but the women who have served Jesus throughout his ministry want to continue to serve him after his death. They’re more loyal than the male disciples, who fled and betrayed Jesus, but like the men these women don’t seem to have believed Jesus’ predictions of his death and resurrection. They’re prepared to care for a dead body, not be confronted by new life. As they walk, they wonder about the stone that had been rolled over the entrance of the tomb, a stone too large for three women to move by themselves. But as they arrive at the tomb they find that the stone had already been rolled back. By whom? Entering the tomb, they find a young man, a heavenly messenger, who tells them that Jesus has been raised. Again, by whom? Another actor has entered the drama, someone who rolls away stones and raises the dead. On the cross Jesus cried out his abandonment by God. Now we learn that God did not abandon him. 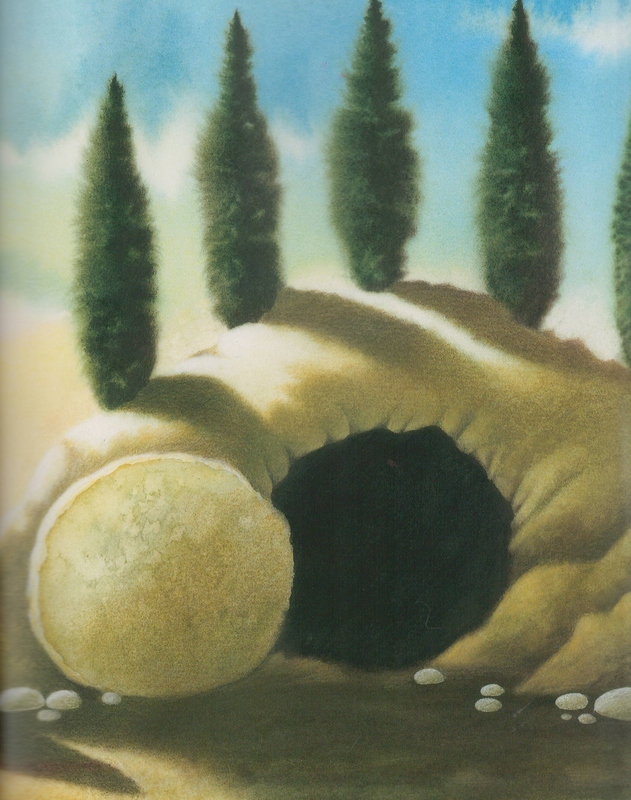 The stone has been rolled away and Jesus has been raised; he is not here. God has taken over this story of betrayal and abandonment and death, intervening to change the ending. The story is astounding. But it’s not joyful and triumphant. The women are given a message to pass on to the other disciples. We’re told that because of their fear, they didn’t say anything to anyone. All the way through, when the twelve, the male disciples, were getting it wrong, the women had been getting it right. They had served Jesus; followed him; witnessed his death when the other disciples deserted him; come to anoint his dead body when Peter and the others were nowhere to be seen. But, now, finally, they too fail. No one, neither the twelve nor the women, succeeds in their discipleship. One of the messages of Easter is that that failure doesn’t matter. Human beings may fail, all of us do fail, but God doesn’t. Discipleship isn’t earned by success. The message of the young man to the women is that the disciples are to meet Jesus in Galilee. Despite their failure, they are still disciples. And despite the women’s fear and flight and silence, the story was told. Mark was writing for a believing community, and his gospel has been read by believers for thousands of years. The gospel itself doesn’t tell us that the women overcame their fear and passed on the young man’s message. It doesn’t tell us that the disciples went to Galilee and met the risen Christ. But it doesn’t need to. These things must have happened, or the gospel would never have been written. The story doesn’t end with the end of the written gospel. The story continues in the lives of everyone who reads it. Who are the disciples that the young man refers to when he says: “tell his disciples and Peter that he is going ahead of you to Galilee; there you will see him, just as he told you.” James and John and the rest of the twelve, obviously. Peter, mentioned by name, with the suggestion that this means he has been forgiven for his betray*al in the courtyard of the high priest. The rest of the women who had provided for Jesus in Galilee and followed him to Jerusalem. Joseph of Arimathea, who provided the tomb in which Jesus’ body was laid. All of these, and more, were the disciples that the young man told the women to tell. But it doesn’t end there. We are Jesus’ disciples too. We, too, are given the message that Jesus is going ahead of us, that we will see him in the future, just as he told us. This, I think, is why the Gospel according to Mark ends so seemingly abruptly. It is so abrupt because Mark’s story of Jesus doesn’t in fact have an end. Mark is writing a meta-narrative, the sort of story that leaps from the page or the screen into the everyday lives of the readers or viewers. Mark’s story of Jesus continues in the lives of the disciples, from those first ones who had followed Jesus from Galilee all the way down to us, here, today. Mark’s story of Jesus will continue, as we tell it to those who come after us. It will keep going, from one life to another, touching and transforming us. The women did not see the risen Christ at the tomb because he had already left that place of death and resurrection. He was going ahead of his friends, to meet them in Galilee, in their home town, the place where their story of discipleship started, in the midst of their ordinary life. And that’s where we see him today: both going ahead of us and present in our daily life. I can’t finish this Easter Day sermon without making mention of the 147 university students killed in Garissa University College, Kenya. Five gunmen attacked the campus, and reportedly asked students whether they were Muslim or Christian. Muslims were released; Christians were killed or taken hostage. The College is near the Kenyan border with Somalia and the Somali Islamist group Al Shabaab has claimed responsibility. Jesus warned his followers that faith in him would lead to persecution. In comparison with our sisters and brothers in parts of Africa and Asia and the Middle East we Australian Christians are so safe; it’s so easy for us to identify as Christian. There is no chance that we will be killed for our faith here in Australia. The most, the absolute worst, we might face here in Australia is a little mockery. I look at Christians around the world who hold fast to their faith in the face of persecution and I am in awe. And I am inspired, because I know that the hope that enables them to stand up to those who want to kill them is the same hope that we celebrate today; the hope in the resurrection of Jesus. As Christians we know that we have been baptised into Christ’s death and resurrection (Romans 6:4), and we know that all who die will be made alive in Christ (1 Corinthians 15:22). As we remember those 147 university students, and pray for their families and friends, we can be comforted by the sure and certain hope of the resurrection. Did the Al Shabaab terrorists not know that it was Holy Week when they attacked Garissa University College? Did they not realise how much hope Easter Sunday would give Christians around the world, even as we mourn? Mark’s Easter story tells us that Christ is both going ahead of us and in our daily life. He will lead us into eternal life, and he is with us here and now. Where charity and love prevail over injustice and violence; where compassion and hope replace cynicism and despair; where peace and love take root in lives that are empty and lost; where human beings know joy and justice, dignity and delight: there we see the risen Christ. Thanks be to God. Amen. This entry was posted in Sermons and tagged Easter, Garissa University College, Mark 16:1-8, Persecution of Christians, resurrection, Year of Mark. Bookmark the permalink.